BETHESDA, Md. — When there’s a government shutdown, families get shut out of continuous medical treatment that may be their last, best hope. That’s the message from Dr. Francis Collins, director of the National Institutes of Health, to Congress. Collins has been through government shutdowns before. “We know the drill, we just hope we don’t have to do it,” Collins says. Collins tells reporters that during the last government shutdown in 2013, 80 percent of NIH employees were sent home, including researchers and clinical center staff. That meant that families whose loved ones were receiving treatment at the Bethesda campus were turned away, something that Collins says disgusted him, especially given the role of the NIH in those cases. “We’re not the National Institutes of Health in most people’s minds, we’re the National Institutes of Hope,” Collins says. Maryland Congressman Chris Van Hollen, a Democrat, has been urging his colleagues on Capitol Hill to work to avoid a shutdown. Not only are shutdowns costly—he says a Standard and Poors analysis of the last government shutdown put the cost at $24 billion—they have real, negative impacts on Americans. 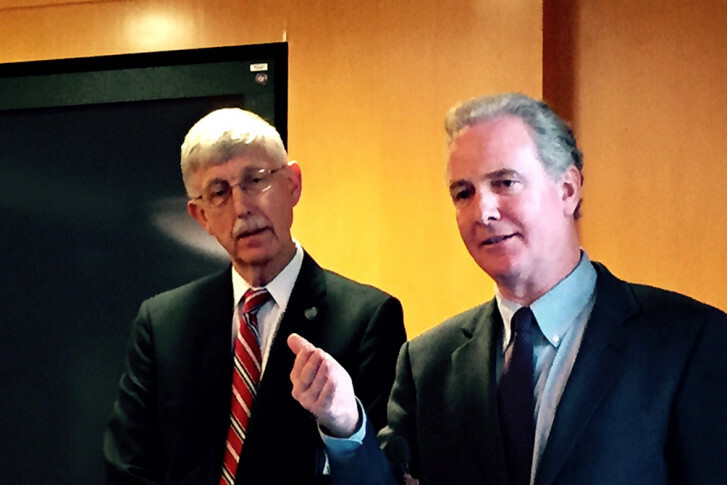 During his Tuesday visit to the NIH campus in Bethesda, Van Hollen says he met a young cancer patient named Denton. “The reality is that if there’s a government shutdown — during that period of time—someone like Denton would not be able to come to NIH to get his treatments,” he says. Van Hollen’s visit comes days before the federal government could shut down. By his count, there are four legislative days left before Oct. 1, the start of the new fiscal year. The Maryland Democrat says he’s worked on legislation to avoid the shutdown and has called on House Speaker John Boehner, a Republican, to work with Democrats. “I’m hopeful the Senate will act, we’ll see,” Van Hollen added. Aside from the impact that a government shutdown would have at NIH, Van Hollen said he’s also working to boost funding for the facility. “The sequester hit us with a loss of $1.5 billion,” in the research budget, Collins says. That shut off funding for 600 grants that had been scheduled for approval. “Who knows which of those grants might have resulted in the next big breakthrough in cancer or diabetes or infectious disease?” Collins says. The NIH director told reporters that the facility’s biomedical research resources have dropped by a quarter since 2003.